Donnie was born in Beech Grove, Indiana to Cecil Donald and Roberta Jean “Bobbie” McGinnis on May 28, 1962. He attended Perry Meridian High School graduating with class of 1982. 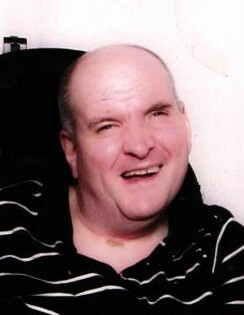 Donnie was a member of the self-advocates of Monroe County and he loved traveling and the theater. Prior to his illness Donnie was employed by AMC Theaters. Donnie was preceded in death by parents; grandmothers Flossie Flater and Florence Brummett; aunts, Dixie Shuffitt, Irene Lacey and Betty Nolting and his uncles, Lloyd McGinnis, George McGinnis and Buddy Maples; and cousins, Scotty Maples and Jimmy Maples. Funeral services for Donnie will be Thursday March 21, 2019 at 1:00 p.m. at Chandler Funeral Home in Ellettsville with Pastor Brian Bolton officiating. Calling for Donnie is on Thursday from 11:00 a.m. to time of service at the funeral home. Memorials may be made to the Stone Belt Arc in his memory.